When a pre-programmed 2-tone/5-tone code or call from a specific user (MDC mode only) is received, the radio vibrates powerfully enough to be felt through heavy clothing. When a pre-programmed 2-tone/5-tone code or a SelCall (MDC mode only) is received, the voice recorder automatically starts recording the incoming message. You will not miss an important call even when you are temporarily away from the radio. You can manually start recording incoming calls and also your own message. It records up to a maximum of 8 minutes (Or up to 48 calls of 10 sec. recording time). The IC-F50V delivers a loud 700mW* audio output with the built-in BTL amp. The built-in audio compander provides clear, low noise communications. Improved bass characteristics also betters the audio quality. When the radio is not operated for a preset period (1 to 255 min. ), the radio sounds a beep and requires you to push the emergency button. If the emergency button is not pushed for a preset time (1 to 255 sec. ), an emergency signal automatically transmits and informs your co-worker or dispatcher that something may have happened to the individual worker. 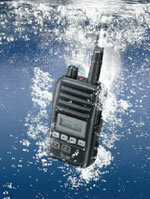 The IC-F50V has outstanding protection against dust and water that is equivalent to IP67. The IC-F50V can withstand submersion in 1m depth of water for up to 30 minutes and has dust-tight construction that prevents the ingress of dust. Use the built-in CTCSS, DTCS, 2-Tone, 5-Tone and MDC signaling capabilities to set up your talk group or selective calling. The IC-F50V can decode ten 2-Tone codes or eight 5- Tone codes on a channel. When a matched tone is received, the following actions are programmable for each code. In the mode dependent setting, the scanning setting is dependent on the operating channel. When you change the operating channel, the scanning list automatically changes to the operating channel setting. It is convenient when you move to a different operating area and change an operating channel, you don’t have to change the scanning setting. The Tx channel while scanning can be programmed per scanning list. The talk back function allows you to transmit on the channel detected after scanning resumes after a preset time, prior to the Tx channel setting. The nuisance delete function temporarily deletes a busy channel from the scanning list. Backlight at stop scan automatically turns on the LCD backlight when the scan stops. 56(W)×97(H)×36.4(D) mm* compact body with durable, dependable construction, has been tested to MIL standard specifications. The large capacity 1700mAh Lithium-Ion (Li-Ion) battery pack, BP-227 provides a practical 9–10 hours* of operating time. BTL only version (no vibration alert and no voice recorder).